WolframAlpha, the “computational knowledge engine,” is fantastic for those interested in math, science, engineering, music and more. If you haven’t heard of it, it’s worth investigating. It’s not a web search engine like Google or Bing, but instead is a searchable database of just about anything science-related. Want to know about the Sun? Do you like caffeine? Have a need to convert AU to parsecs? Looking for a solution to a differential equation? 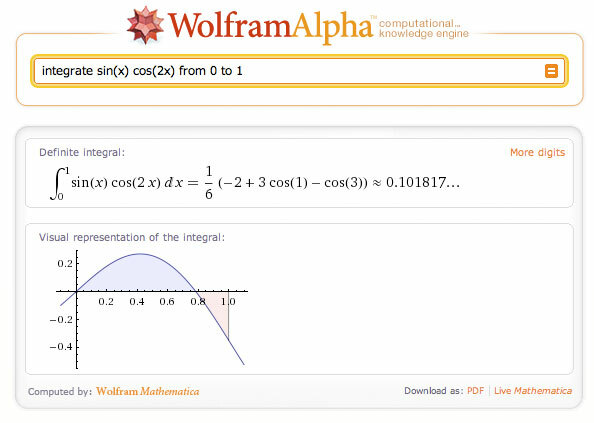 Wolfram’s got your back! WolframAlpha cranked out this integral calculus problem almost immediately! I wish I could say the same about my HP calculator! 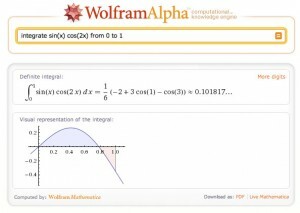 This entry was posted in Internet, Mathematics, Science, Technology and tagged math, wolfram by chopsake. Bookmark the permalink.